A man found fatally shot at a home in Fremont early Monday morning has been identified as 56-year-old Dominic Sarkar, an executive chef at a restaurant in the city. Sarkar was found dead in the bedroom of a home where he lived in the 43000 block of Charleston Way after officers responded to a report of gunshots at about 12:30 a.m., police said. A witness reported seeing a male suspect leaving from the area of the front door of the home, get on a bicycle and pedal away, according to police. The victim had been renting a room at the home, which he shared with another family. Members of that family were asleep at the time of the shooting and didn’t see the suspect arrive or leave from the home, according to police Lt. Mike Tegner. Officers searched the area, using a drone and police dog to look for the suspect, but did not find him. Tegner said the killing does not appear to be random, and there were no obvious signs of forced entry or a struggle in the home prior to the shooting. 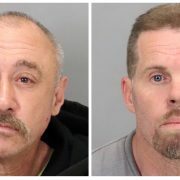 Anyone with information about the homicide is asked to contact lead investigator Brent Butcher at bbutcher@fremont.gov or to call Fremont police at (510) 790-6800. Anonymous tips can be sent to 888-777 with the message “TIP FremontPD” followed by the tip.